Second day in Tokyo. Started off the day picking up an Amp for DSK to use at Tower Records, then called Hiroshi Fujiwara. He was in his office so I stopped by to chat. We made some rough plans for filming this coming winter. Sounds like HF will be coming up to Hokkaido for a winter fashion shoot very early in the season. Also check out the new Honyee MAG that is out in Stores now! Magazine looked great, Ue is featured in the mag as well! Here HF shows me the new Rolly speaker from Sony. This thing is crazy it moves and dances perfectly to the music as it rolls around the floor! Great little speaker for traveling, and you won’t get lonely with it dancing around the room. Tower Records event went even better than I expected! A good crowd was there for us and DSK impressed everybody with his live guitar playing while the movie was showing on the screen. It was nice to know that UE_snowboarder was the first Snowboard related DVD to ever be played live in Tower Records Shibuya. The DVD is selling well there the staff told me, so I hope they do even better as winter starts! Please check out DSKs new album MODEST and also the just released Aurora live album. DSK and Inoue Kaoru make up “AURORA“. Last year we did a Yoga event at a temple outside of Tokyo called Monshu-in. Aurora performed at that event and that very performance is included in the album! Great mellow instrumental stuff to chill out! Here DSK signs my copy of MODEST! Had dinner and chatted with UE after the event. As usual we talked about plans for the future and the hopelessness of the Snowboard industry in Japan….. Always good to chat with Ue. After dinner went straight to Club Asia in Shibuya just before midnight. Goma and the Jungle Rhythm section were playing live! I wanted to film their performance so I took my video camera and recorded the show. Packed with people everybody dancing to the good rhythms of Goma’s music! here is the band after the show! Drove back to Tokyo today for the showing at Largo! Great time with a great bunch of Snowboard loving people! Last year we showed Car Danchi and some of the same people were back again, so it was nice to reunite with everyone! After the showing we went to an “izakaya” nearby for some good food and of course talking about Snowboarding until about 3am! A big thank you to the Largo staff! What a great shop, one of my favorite shops in Japan, they really know what it means to be a “Pro-Shop” Respect to largo! Thanks again everyone who was there, if you missed it we will be at Tower Records in Shibuya from 7pm on Saturday night! Special performance from DSK as well as movie showing! Added a new photo to the store. One of my favorite sunset shots from the last few seasons! Ok everybody heading back to Tokyo tomorrow night for the Film showing at Largo in Shinjuku! Looking forward to a fun night! I will be commentating the film while we show it! Just got this photo from an old friend in NZ Olly Brunton. Snowpark looks to be having a great spring! End of September and he says the pipe is still in great condition, wish I was down there right now! We are going to be at Tower Records this coming Saturday in Shibuya. Could be a first for a Snowboard video. Will be showing parts of UE_snowboarder along with Uemura and special guest DSK! You will be able to see a special performance from DSK live, so make sure to stop by. Event starts at 7pm! Be there! 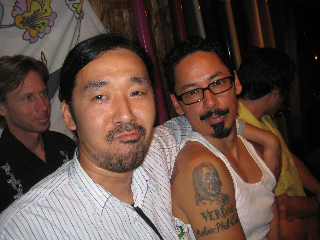 Went to see Tommy Guerrero live at “California” in Fujisawa two days ago. Great show with opening act DSK. Great vibe down there in Fujisawa. There must have been 700 people there. California is normally a surf shop and the location is in a residential area. After the performance all those people were partying in the street and no one from the neighbor hood called to complain. The police did a drive by through the crowd on the street and then just left with out saying anything. Amazing. Really impressed with the Fujisawa people! Here is a photo from K9 my frame supplier! I got to meet TG but I did not get a picture with him!